The forecast for the area now is for devilish NE winds with gusts up to 50 mph continuing until tomorrow morning. As terrible as the results of this fire are, it could well become much worse. Pray in the hope that in God’s will it doesn’t. Pray comfort for those who have lost so much. I don’t generally post my prayers. Feel very queasy about public prayer. And the wind building again. Four days after the devastation of the town of Paradise and there are still 231 people unaccounted for. 30 bodies--or bones and fragments--have been located. With 6500 homes destroyed it is feared that the number of fatalities will increase dramatically. 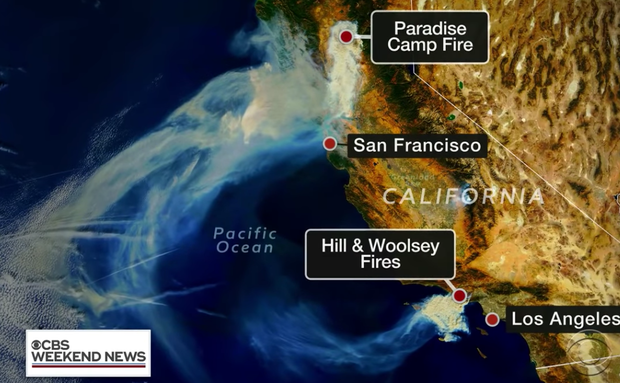 And this has already become the deadliest fire in California history. Sherrif's Dept has received calls about 1500 people that have not been heard from since last Thursday. That is not good. In addition to 13 coroner-led recovery teams working in the fire zone, 150 search-and-recovery personnel are due to arrive today, Tuesday. I've got to get myself in to talk to someone because this is hard to shake off. My heart grieves. It feels like all my memories of the place are burned up, too. I'm sorry to hear that, Goose. I've been praying for the town, of course, but I've been praying for you, too. You've mentioned that your memories are burning, too, and that concerns me. Is the town on fire in your memories? Like if you pictured a street or a place in your mind from when you were there, is that on fire? I'm going to pray now, Goose. Then I'm going to give you a call. Thank you. It was nice talking with you. Enjoyed it very much, sir. Thanks for taking the time. Maggie (my cat) sends fraternal greetings to Lucy. It had been thought that 6700 homes & businesses had been destroyed but officials raised the loss of homes to nearly 8,800 Wednesday. Sheriff Kory Honea said the task of recovering remains had become so vast that his office brought in another 287 searchers Wednesday, including National Guard troops, bringing the total number of searchers to 461 plus 22 cadaver dogs. He said a rapid-DNA assessment system was expected to be in place soon to speed up identifications of the dead, though officials have tentatively identified 47 of the 56 so far found in the grizzly aftermath. "This is one of the worst disasters I've seen in my career, hands down," Brock Long, head of the Federal Emergency Management Agency, told reporters in nearby Chico. The Paradise Fire also stands as one of the deadliest U.S. wildfires since the turn of the last century. More than 80 people perished in the Big Burn firestorm that swept the northern Rockies in August 1910, incinerating 3 million acres. Tally of missing in California's deadliest blaze surpasses 600 and the number of destroyed structures is now at 12,000. According to the Associated Press, a PG&E customer who lives near the origin point of the fire reported receipt of an email from PG&E a day before the fire notifying her that power lines near or on her property were having trouble with sparks. Air Control Board listed the air quality as Hazardous for my five county area. The sunrises have been surreal looking. When the rains start they can be heavy rains, and continuous for a day or more. This could mean that the remains of most of the now over 1000 still missing may never be located. Washed away, back into the ground. Gruesome reality, but many/ most were reduced to ashes. The only ray of hope is that some of those 1000 left the area and don't know they are listed as missing. Folks burned out of their homes were tent camping next to the Walmart parking lot and told they had to leave (the order was rescinded, thankfully!) but rain is coming. A terrible situation for those who survived so much loss to have to deal with! "Sheriff Kory Honea said it was within the "realm of possibility" that officials would never know the exact death toll from the blaze. He also questioned whether the search for remains could be completed by midweek when rain is forecast. "About 1,000 names remain on a list of people unaccounted for more than a week after the fire began." I have so many mixed feelings having called Paradise, CA my home of many years. To me it seems eviscerated; wiped off the face of the map. People there worried about fires but nothing of this magnitude. There's nothing to come back to but charred remains. It's apparent how heavily this is weighing on you Goose. I'm praying for all those affected by this disaster, especially the one I know.